is mounted horizontally below the center of the dial, as shown in figure 7-18. When the pilot is executing a properly banked turn, the ball stays in the center position. If the ball moves from the center position, it shows the aircraft is slipping to the inside or the outside of the turn. Centrifugal force and gravity determine the position in which the ball rests. NAVIGATIONAL INSTRUMENTS The following navigational instruments direct, plot, and control the course or position of aircraft. 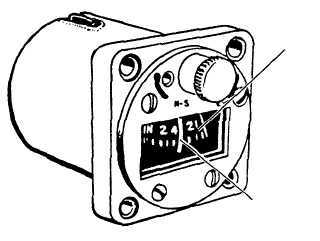 Magnetic (Standby) Compass A direct-reading magnetic compass (fig. 7-19) is mounted on the instrument panel. The face of the compass is read like the dial of a gauge. Gyro Compass The gyro compass is used in many naval aircraft. The system provides an accurate indication of aircraft headings through 360E of azimuth. Horizontal Situation Indicator The newest naval aircraft use the horizontal situation indicator (fig. 7-20). It shows the pilot the navigational situation of the aircraft. Q7-7. Generators that produce alternating current (ac) for aircraft are known as what type of generators? Q7-8. Most naval aircraft use what type of system as their primary source of power? Q7-9. What is the purpose of airborne auxiliary power units (APUs)? Q7-10. The pitot-static consists of a pitot-static tube and three indicators. What are the three indicators? Q7-11. What is the function of the altimeter? Q7-12. Define the Mach number of any moving body. Q7-13. What information does the attitude indicator provide to the pilot? Q7-14. What information does the turn and bank indicator provide to the pilot? Q7-15. What are the three navigational instruments that direct, plot, and control the course or position of an aircraft? COMMUNICATIONS AND NAVIGATION EQUIPMENT LEARNING OBJECTIVES: Recognize the general characteristics and uses of communications and navigation equipment. Identify the basic purposes of navigational systems and equipment to include TACAN, Global Positioning System (GPS), and navigation computer systems. This section presents information on airborne uses of radio communications and navigation. Radio equipment does not require interconnecting wires between the sending and receiving stations. 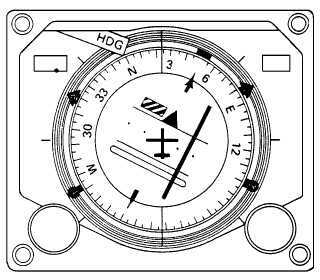 It is the 7-13 LUBBER LINE COMPASS CARD ANF0719 Figure 7-19.Magnetic (standby) compass. MILES TAS GS 877 CPR TCN HDG SET CRS SET LF UHF TCN COURSE TRU MAG 050 ANF0720 Figure 7-20.Horizontal situation indicator.